The Chrome Breakfast Bar Stool White conjures up images of refined sophistication with its classic modern design. Mixing fantastic comfort and support with versatile style and practicality, the Chrome Breakfast Bar Stool offers minimalist flair. Elaborately detailed with delicate stitching upon a white faux leather padded seat, it is utterly chic. The high back padded seat is supportive whilst still expressing contemporary style, with its delicate curve to the backrest and distinct stitching. Cast upon a slender but sturdy chrome frame and base, the white seat along with the sparkling chrome are set off by each other to display an original style that will be set alight within the room. 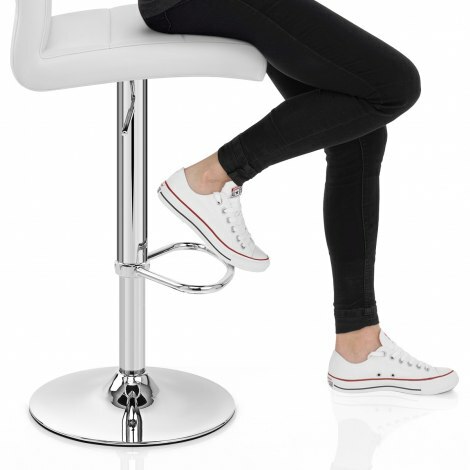 Adjustable height and 360-degree swivel allow added usability to the stool, and there is also a protective floor guard to keep your floor perfect. "Excellent product, value for money"
We recently decided it was worth the drive to Birmingham on a Saturday to check out the range of bar stools on offer at Atlantic Shopping. So glad we did! Great range of stools, and although we went to look at Mint bar stools, we bought 4 Breakfast bar stools, as we found them to be really comfortable and had just the look we wanted. As we thought they might not fit in the car we asked about delivery - they were delivered on the Monday, 2 days later, free of charge. Thoroughly receommended! Normally do not write reviews as am getting fed up with always being asked. But in this case I would like everyone to know the product was great. Easy to assemble and well made. Would certainly recommend these to anyone considering getting them. Recently purchased three of the bar stools after searching both on line and in stores. The stools arrived the nextday, very little building involved. They look great and were a third of the cost from a major high street store.